Replacement of the shoulder joint is commonly done for arthritis or bad fractures of the shoulder. XRay of a shoulder replacement done for a 72 year old heavy diabetic lady with multiple fractures. XRay before and after replacement done for a 55 year old lady with severe Rheumatoid arthritis. Revision knee replacement is usually done for loosening of the prosthesis. It entails the use of special implants to compensate for bone loss or damaged ligaments. XRays following a revision Knee replacement done for a 73 year old lady. 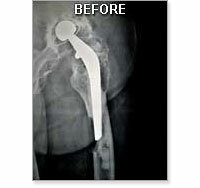 When a hip replacement fails there is usually loosening of the prosthesis with bone loss. Revision requires the use of special implants and techniques. 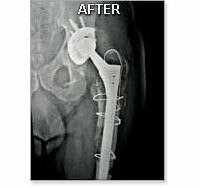 XRays before and after surgery of a 79 year old dentist who underwent revision hip replacement.